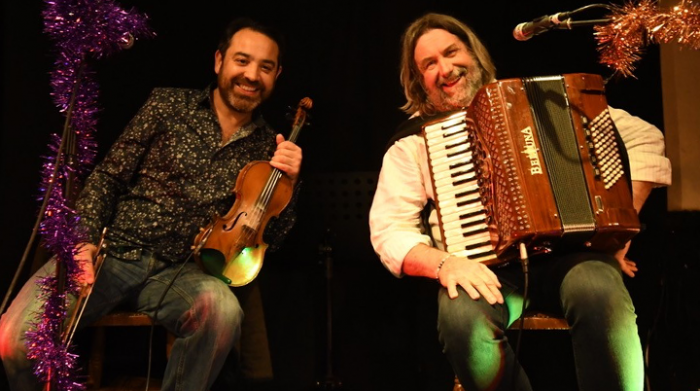 Paul Hutchinson (accordion) and Paul Sartin (oboe, violin and vocals) are, by their own admission “one folk’s odd couples”, have been entertaining audiences around Europe, The States and Australia, for the last 25 years. With virtuoso musicianship tempered by wry humour and ‘ extravagant lifestyles to support’, as well as a love of music, thankfully their candle looks set to burn for a good few decades more. These two reprobates are going to be joining forces again at the end of the year to tour with their celebrated Christmas show that will again mix traditional folk music, seasonal material, a stirring of classical, pop and music hall, all topped off with a huge dollop of wry humour !! Be warned however … you can never escape the ‘audience participation’ no matter how low you sink in your seat ?? !